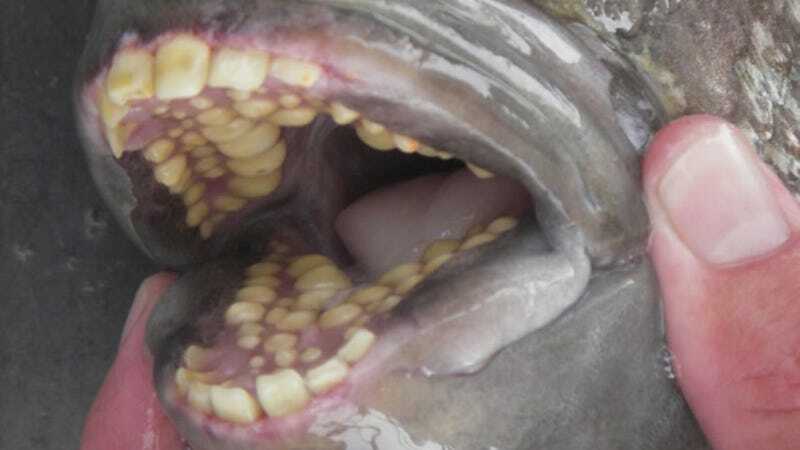 This is the mouth of a sheepshead (Archosargus probatocephalus), a marine fish with one set of very human-looking teeth, and a whole mess of hellishly stubby, decidedly un-human-looking teeth. It is at once familiar and alien, and more than a little creepy. But it will not give you nightmares. Actually, it might. Just look at it. LOOK AT IT. Oh god the shivers. These things can grow up to 20 inches in length. Can you imagine that mouth at the end of a 20-inch fish? Of course you can. Who the hell am I, then, to tell you that this fish won't give you nightmares? Another good thing about this huge creep [the sheepshead] is that, unlike one of its relatives, the Salema porgy (Sarpa salpa), you won’t risk having a terrible trip when you eat one. Apparently they taste great! The Salema porgy, also of the Sparidae family and nicknamed the dreamfish, was reportedly used for recreational hallucinogenic purposes in the Mediterranean during the Roman Empire and has played a role in traditional Polynesian ceremonies. Along with a handful of other fish, the flesh of the Salema porgy can sometimes inflict ichthyosarcotoxism on those who eat it, which is a very rare form of poisoning caused by the toxins of a tiny species of marine plankton called Gambierdiscus toxicus. This poisoning from contaminated fish flesh prompts intense hallucinations and terrifying nightmares that can last for several days. Nope. Still creepy. Also weirdly vaginal, right? Okay, I think we're done here. The disembodied jaws pictured above come from this paper on intralocality variation in feeding biomechanics and prey use in sheepshead, via the blog of Laurent Darras, a PhD student specializing in the dentition of modern and fossil fishes (which sounds genuinely awesome). More on the this toothy fish and its psychedelic relatives over at SciAm.